Today, we are the largest wholesaler of water in the country. We bring water to more than 31 million people, and provide one out of five Western farmers (140,000) with irrigation water for 10 million acres of farmland that produce 60% of the nation's vegetables and 25% of its fruits and nuts. 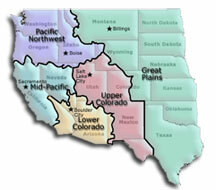 Reclamation is also the second largest producer of hydroelectric power in the United States. Our 53 powerplants annually provide more than 40 billion kilowatt hours generating nearly a billion dollars in power revenues and produce enough electricity to serve 3.5 million homes. Today, Reclamation is a contemporary water management agency with a Strategic Plan outlining numerous programs, initiatives and activities that will help the Western States, Native American Tribes and others meet new water needs and balance the multitude of competing uses of water in the West. Our mission is to assist in meeting the increasing water demands of the West while protecting the environment and the public's investment in these structures. We place great emphasis on fulfilling our water delivery obligations, water conservation, water recycling and reuse, and developing partnerships with our customers, states, and Native American Tribes, and in finding ways to bring together the variety of interests to address the competing needs for our limited water resources. At Reclamation, our core values are professional excellence, safety and respect. Professional excellence: We are results-oriented. We embrace a “can-do attitude” finding solutions to complex problems by providing valued results. We strive for excellence in every aspect of our work through professional acumen and technical competence; empowering our workforce to foster creativity and innovation. Safety: We share a personal commitment to protecting the safety of each other, contractors, customers, as well as the people and communities served by our projects. Respect: We embrace a culture of respect for people through our own ethical behavior and with clear, effective communication. We treat people with dignity and respect, fostering an environment that supports diversity, collaboration, inclusion and excellence. We conduct ourselves with integrity, striving to be trusted public servants with the highest ethical standards. We actively listen and share information in a transparent manner.